With reduced layers as we enter spring, we turn to texture. 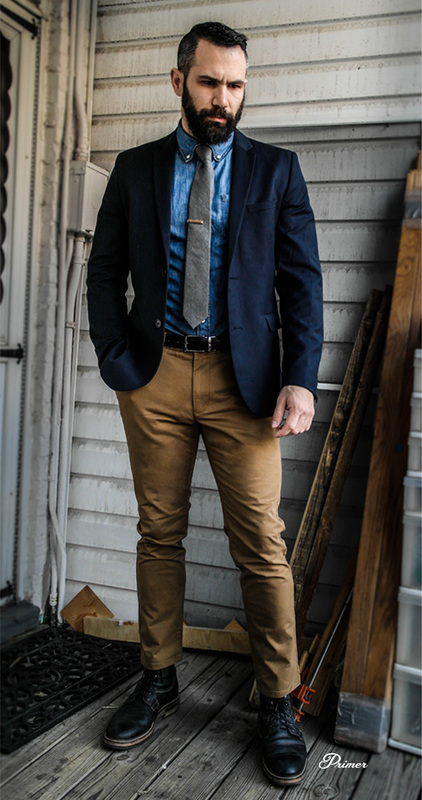 Both the shirt and tie are chambray and with the boots, the look has a workwear vibe, but it's dressed up with the pants and jacket. A little bit of a clash between formalities, but that's the idea. It says "I work for a living, but clean up well". I love this get up but I feel that the boots are just a bit of a clash. I think they are just too chunky. Maybe chuckas or some dress boots? anyone agree? I feel like if the pants had another inch or two of inseam, the boots would stand out a lot less. Those puppies are HIGH. Taller guys need to be more mindful of it, that’s true. Hey Deke – I’m the guy pictured. The pants are slim around the calf and I have soccer calves, so they don’t sit as low as I’d like. At the same time, highlighting the boots is part of the outfit, as the workwear looks asks for a workwear shoe to round it out. Your feedback is much appreciated! I love this site. How awesome is it to get interaction with both the author and the faceman? Anyways, I get the slim pants/big calves and the desire to highlight the boots. Similar to Bill H. above, I’m a taller guy and I feel like being forced to wear high waters from time to time as a kid going through growth spurts has kind of scarred me. I’ll occasionally show a little ankle in warmer weather, but I generally still like having the pant legs at least brush the tops of my shoes. Different strokes for different folks, as they say. Despite my preference for longer pants, I dig the getup and respect that beard. Thanks for taking the time respond! You’ve picked up on how important footwear is in an outfit, these boots were chosen for the more rugged look because of how they shift the outfit as a whole. Chukkas, dress boots, wing tips, suede oxfords would all look good here and create a different outcome. Feel free to swap as needed. I think the boots would be fine if the pants aren’t as short as those pictured. I never will come around to the zero break or high water look. I’ve got to have at least a half break in my pants leg. Nice items but not well put together. The chinos are a little too tight and too short. the tie is too short. And even though the shirtsleeves are running long the jacket sleeves are still too long. Hi Jimmy thanks for sharing your thoughts. These are all intentional decisions for this outfit, but like all the Getups they are here to act as inspiration. Each person needs to adjust for their own personal style, location, and venue. Hey Jimmy, the length of the tie and sleeves are all fine throughout 90% of my daily activities. When I put my shoulders all the way back for a picture, things sit differently. It’s not a matter of fit; variation is pretty normal over the course of a day. What’s with the current trend of high-waters in men’s style? It’s all just changing trends, remember when we were walking on our frayed wide leg jeans like 10 years ago? Specifically pants have gotten higher as the leg opening has gotten more tapered. I get that the trends change and that the no-break hem is a good look, but the high-waters look is pushing it past that to the point of being akin to women’s ankle pants. In many places in Europe men already wear capris. Just because something is done in many places in Europe (or anywhere for that matter) doesn’t make it a good choice. There are plenty of bad but popular fashion choices made each day in plenty of places, but that doesn’t necessarily legitimize them. Not saying that it’s a good choice. Only that it’s done. I absolutely agree regarding the high waters and I actually prefer at least a half break and sometimes up to a full break. Though I’m not a fan of stacking as it is simply the opposite extreme to me. Please, for the love of God, stop telling people to buy cheap watches! I’m not saying to go out and get a Rolex, but that $50 watch will have the hour hand fall off within days. I disagree. I’m sure there’s terrible watches out there but a Seiko 5 is about that price for an automatic and they’re great for every day use. Hi Sean, we regularly feature watches at higher price points. The goal of Primer is to provide affordable options for a range of budgets and needs. A lot of guys have one “nice” watch and fill in with less expensive ones for variety. Really? “…that $50 watch will have the hour hand fall off within days”? Oh, please. Can we lose the watch snobbery? I appreciate nice watches and the craftsmanship that goes into them. But the sad fact is that an inexpensive quartz watch will frequently keep time better than many expensive mechanicals. Thanks for including various price options on the posted items. I can’t always afford the highest price, so have a lower cost alternative is nice.. I like the black leather with the brown pants. I usually reserve black for more formal attire but that’s a good looking combo. Great getup, Andy. Keep doing you. Feature items too expensive, waaah, too cheap, waaaah…Can’t win ’em all! This is wonderful stuff. So glad you guys stepped up in the Getup series. now this is a sharp getup! Love these- I like the variety in price offerings, and all of the selections are easily tailored for individual variances in personal style! I stumbled on the Wolverine Ramon at Nordstrom Rack for about $90 (not sure if they’re still available, couldn’t find them online). Keep up the good work!